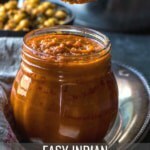 Easy Indian curry sauce recipe – Whether you make Indian food regularly or occasionally, having this curry sauce in your refrigerator will save you time. Skip Indian takeout and make fresh and delicious Indian meals in minutes! What is a curry sauce? 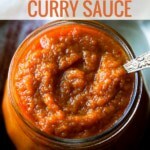 A curry sauce is a base sauce that can help create delicious Indian meals in half the time. Use it to make most popular Indian recipes from biryanis to makhani – all with the same base sauce. And if you are worried about having the same flavor across dishes, let me just say this – your worries are unfounded. How’s that possible, you ask? The first layer consists of tempering where whole spices are added to hot oil. You could also end a dish with tempering or do both. Layer 2 would be adding chopped onions, garlic and ginger and frying them until the onions are soft and translucent. Then add the chopped tomatoes next. Cook this onion-tomato mixture till the tomatoes turn soft and mushy and oil starts to separate out. Next layer would involve the addition of spice powders (coriander/cumin powder) and frying them for a minute or two before moving on to the fourth layer. The fourth layer would be the addition of veggies or meat/chicken/seafood along with liquids (coconut milk, yogurt, water, milk or cream). The last layer is the finishing touch – adding a dash of lemon juice, maybe a tad bit of garam masala, chopped cilantro leaves, dried fenugreek leaves etc. The dish could also be finished off by tempering as in the case of dal or sambar. As you can see this sauce is just one layer or component in any dish. Vary the tempering, spices, and spice powders, and no two dishes will be the same. How do you make curry sauce from scratch? Do not add salt – The curry sauce is made from a puree of onions, tomatoes, ginger, garlic and the only spice that is used is chili powder. Salt is deliberately left out and can be added later as needed. The key reason is that quite a few dishes(e.g. kidney beans, chickpeas) are cooked with salt prior to being combined with the sauce. Use the best produce available – For the best tasting sauce always use the freshest ingredients. 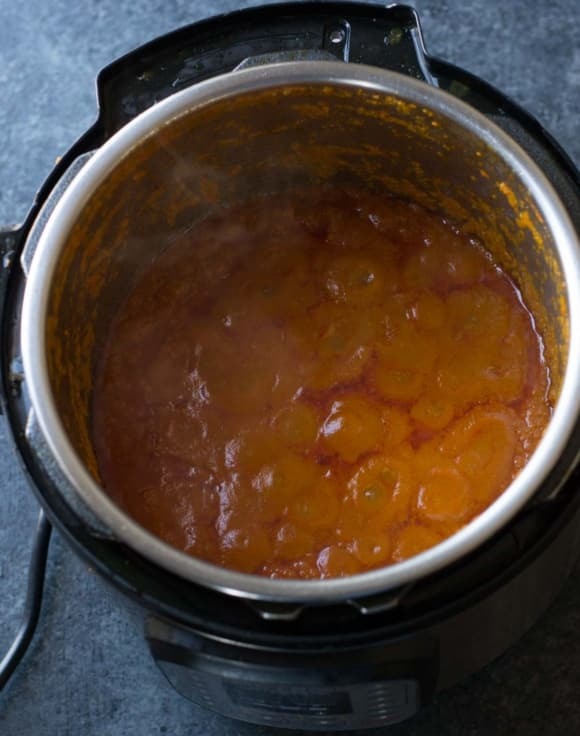 Do not add water while blending – This sauce is made by cooking the onion-tomato puree until almost all the moisture evaporates and oil starts separating from the sauce. Adding water to make the puree increases the cooking time. Tip – While making the puree, always add tomatoes first as they get pureed quickly and that ensures that no other liquid is needed. 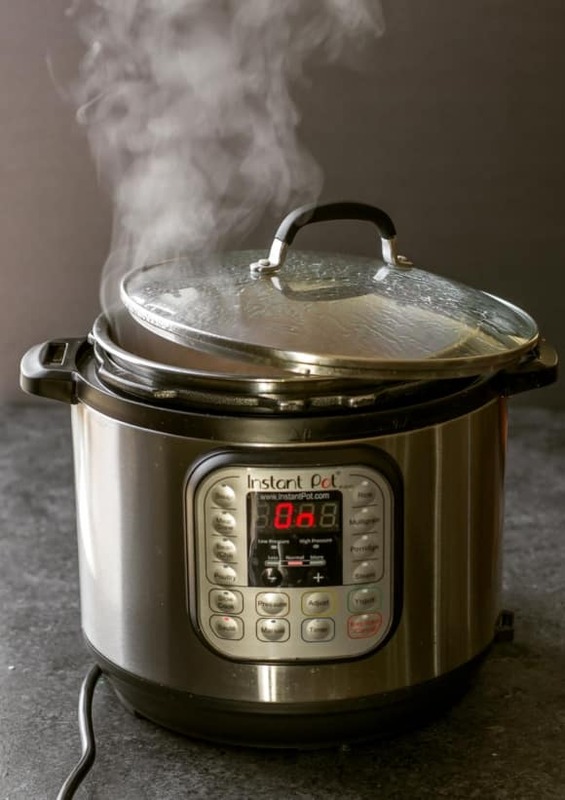 Time to cook – The time to cook this puree will depend on whether you are using Instant Pot or doing it over stove-top; the latter is faster. Do not fully cover your Instant Pot or your wok while making the sauce – you do not want the water collected on the lid to fall on your sauce. That’s the reason I do not recommend you pressure cooking the sauce. The water does not evaporate while you are cooking under pressure. Cook on low heat once the mixture comes to a boil – The sauce splatters so cooking on low heat is recommended. How do you make a creamy curry sauce a.k.a restaurant style gravy? Like I said, this curry sauce is extremely versatile and can be easily used as a base sauce for your makhani /restaurant style gravies. The creaminess in restaurant-style gravy can be attributed to one of two things – heavy cream and cashews. You can either use both or one of the two. To make restaurant style gravy dish for a family of four, start with a cup of curry sauce and follow the directions below. Cashew paste – To make a cashew based curry – soak 1/4 cup unsalted cashews in hot water for 5 minutes and grind them to a fine paste and add it to a cup of this curry sauce to make the base gravy for restaurant style paneer makhani and butter chicken. Heavy cream – Add 1/4 cup of heavy cream once the cooking is completed. Mix well and take the curry off heat. Coconut milk – Add 1/4 cup coconut milk along with the vegetables or seafood/meat. Add yogurt + coconut milk – use about 2 tablespoons of yogurt and 2 tablespoons of coconut milk for a creamy yogurt-based sauce such as in this shrimp curry. If you want to use only one of the two – use about 1/4 cup of yogurt or coconut milk. Final note -> The recipe below yields 5 cups of curry sauce and takes approximately an hour and a half to make. Don’t worry, you don’t have to be around your Instant Pot or your stove-top for that long. You probably need to stir it once in 15 minutes. If you decide to halve or double the recipe, feel free to do so but remember this – the cooking time also varies accordingly. So look for visual cues such as the oil separating from the sauce to know when the dish is done. 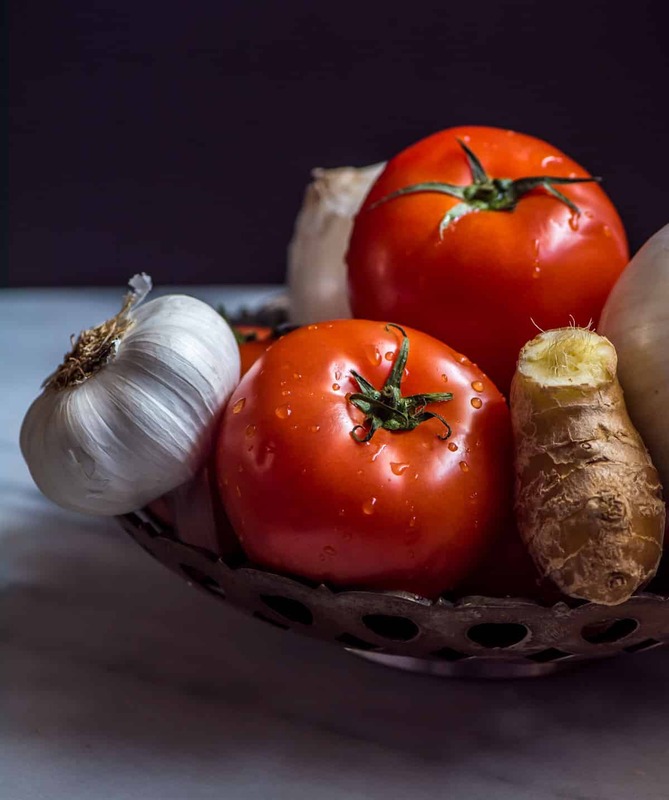 Blend tomatoes, onions, ginger and garlic to a fine paste without using water. Note -While making the puree, always add tomatoes first as they get pureed quickly while ensuring that no other liquid is needed. Instant Pot method - Add oil to the steel insert of the Instant Pot and press the Saute function. Press the Adjust button to move the selection to “normal” and wait till the display reads “Hot.”Add the pureed tomato-onion paste and let it come to a boil.Cover the Instant Pot partially to avoid water from the lid falling back into the gravy (see the picture in the tips section above).Press Warm/Cancel and select the Saute function and adjust the heat to 'low'. Continue to cook until oil begins to leave the sides and most of the moisture has been evaporated. When you are cooking for a family of four, a cup of curry sauce is sufficient for most recipes. This recipe yields approximately 5 cups of sauce. If you are planning on freezing the sauce, divide the sauce into 5 Ziploc bags. This will allow you to thaw one bag at a time. To thaw the sauce, leave it in your refrigerator overnight. How do you use curry sauce? Most popular Indian curries (read North-Indian style gravies) start with an onion-tomato gravy. But how you flavor the gravy is what sets them apart. That’s the reason I have kept this gravy simple, with only 5 key ingredients along with oil. This makes this sauce extremely versatile – use it for something as simple as chickpeas curry (channa masala) or a dish with more complex flavors such as a biryani. And I have also used this sauce for our family-favorite chicken tikka masala pizza as well 🙂 (Recipe coming soon). In any of these recipes, replace onions, tomatoes, ginger, garlic and chili powder with 1 cup of this sauce. A cup of sauce is perfect for any recipe that serves a family of four. Basic Makhani curry – eg Paneer Makhani – soak cashews in hot water for 5 minutes and grind them to a fine paste and add it to this curry paste to make the base sauce. Biryanis like chicken and shrimp biryani. Hi, this sounds great. Once the base gravy is made, and you have added spices (step 3), can your chosen meat be added to the sauce and cooked in an instantpot sealed, or would you recommend a loose lid at all stages of cooking? Marc, if you are planning on continuing to cook in saute mode, you could cook uncovered. Hope that answers your question. I made this sause and it was yummy. But it didn’t really taste like curry to me. Maybe because my store didn’t have Kashmiri chili powder. I used something called fiesta chili powder instead. Do you think that’s the reason? Most likely. Fiesta chili powder has other spices as well and is not 100% chili powder. You could get Kashmiri chili powder from Amazon. Also, I wanted to share that this sauce is a base sauce and has very little spice. It has been made that way so that you could adapt it to any Indian recipe. Sure thank you for sharing the base sauce. I will be making this in my instant pot this week. You’re welcome, Cathy. Thanks for stopping by.